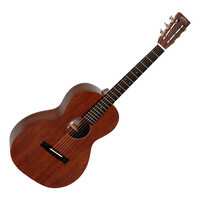 The Sigma 00M-15S Acoustic Guitar is part of Sigmas leading 15 series and features a solid Mahogany top and Mahogany back and sides grand concert size body to produce a deep and warm tonality. Also with a mahogany neck 20 fret Indian Rosewood fingerboard bone nut and saddle and Grover open geared nickel machine heads the 00M-15S provides quality above its price range and has an attractive natural mahogany finish. This entry was posted in Sigma and tagged Guitar-and-Bass. Bookmark the permalink.